← How does clutter grow? After a very long time, I am finally getting the message about meal planning and making life a bit easier for myself. A couple of months ago I read an article in the paper about ‘cooking once, eating twice’. For some reason, this struck a chord. Since then I have been consciously focussing on cooking meals which can be frozen and then re-cyled at a later date. This has definitely been making life easer. Last weekend I cooked a stew. I froze it in three portions. Two of these will be for pasties, and the third is for a pie I have made for tea today. Earlier today I made a very simple rough puff pastry. 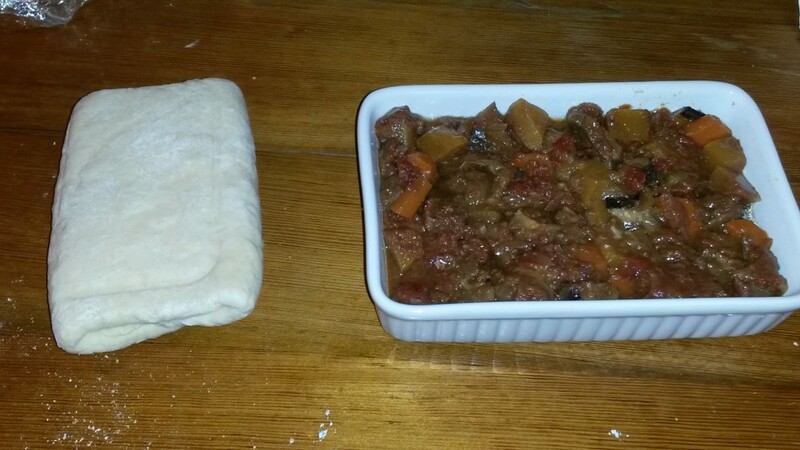 I divided the pastry into three and the other two portions will go into the freezer for the pasties at a later date. And here is my tea this evening – all put together with vegetables in next to no time. What are your favourite easy meals? Do you cook once and eat twice when you can? I cook once, eat twice the majority of the time – sometimes more than twice. Roast chicken turns into chicken pie or chicken fricasse or the remnants get frozen waiting for left over ham for a pie. The carcus always gets used for stock. Roast lamb left overs make the most delicious shepherds pie ever. 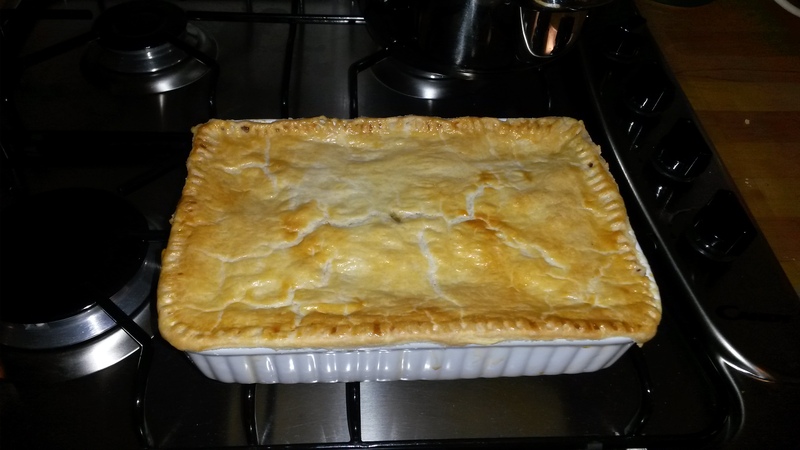 I also batch cook – 10lbs of minced beef get turned into a “mainstay mince” by adding tomatoes, wine, chicken livers, bacon and herbs and frozen ready to use in bolognaise, cottage pie, lasagne, etc. It really does make life easier in the long run. We do a lot of cook in bulk and freezing for later. In fact It’s my husbands speciality. 🙂 It’s a great way of saving money and ensuring that even after a busy day you can still have a healthy ‘convenience’ meal. In fact we do so much we now have 3 freezers to cope with it (and our garden produce/ forage stuff. Good luck with the meal planning, it’s a great way to go to save money and time without compromising on food quality. I definitely need to get a second freezer!